For quite some time now golfers have been using GPS technology to facilitate their game, such as calculating the distance to the next hole or watching out for threats. In this article, we are going to compare and contrast two GPS golf watches – the Garmin Approach S6 GPS vs TomTom Golfer – to help you make the right choice, improve your game, enjoy the time you spend on the course even more and see the world as a happier and happier place every time, because Robert Lynd was, as ever, absolutely right. Now let’s see if these babies will improve the handicap! The first impression you’re going to have of the TomTom Golfer is its funky appearance with a great big navigational button on the bottom. It doesn’t look very fashionable, but it does provide quite a pleasant user interface experience. The watch offers great course coverage and you can update course maps by connecting it to your phone. It’s also pretty easy and straightforward to set up. It provides an exact distance from your location to all points on the green, and you can see all hazards clearly, so you have a great idea which way to go and what to watch out for. Apart from the big button on the bottom the design is sleek and elegant – its square face resembles that of the Apple Watch. The TomTom is also waterproof, so you shouldn’t worry about it raining on your golf parade (but still, the watch will not protect you from lightning and other forces of nature). The watch app is compatible with iPhone or Android smartphones if you want to sync scores and other performance data. Now for the downsides, which the TomTom seems to have a little bit. First of all it does not – unlike the other TomTom watches – feature any kind of multisport functionality. There is also no touch screen, making it hard to select choices from the menu, but this is actually only a problem in the beginning before you select the main settings. After they’re in place, most of the information you need is automatically displayed as you play. You’ll have to charge it after every game, and that’s if you don’t use the GPS. The shots cannot be measured and stats can’t be recorded – you just get a scorecard. Some users complain that hazards look like blobs on the screen. They’re working on a software update for this though. 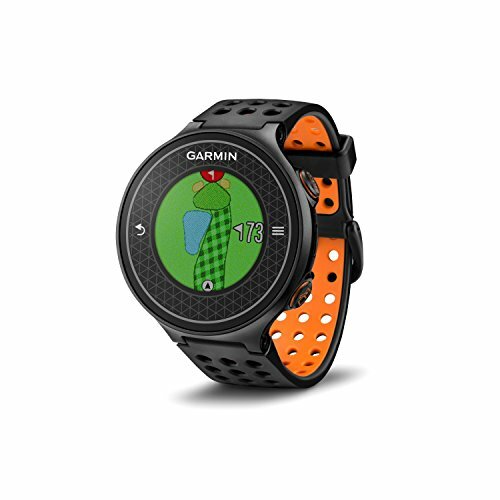 The Garmin Approach S6 is not for any old golfer. You have to be THE GOLFER to appreciate what this product is actually offering. It shows you every inch of every hole on your wrist in full, vibrant colour. Of course, the Garmin fulfils its main function, which is to show the exact distance between you and the green. Users report that this function really works great. Going above and beyond the call of duty, it shows the full layout of the hole in colour. You can choose points on the hole to establish the stretch for the perfect layup. The Garmin Approach has a great, albeit small touch screen. You can touch any part of the green or hole to get the distance. If you can’t see the hole because of some obstacle, the pointer feature of the watch comes in real handy. It does what its name suggests – point you in the direction of the hole. The Garmin Approach S6 is a superb training aid! The Approach is just as useful on the course as it is off it. It’s a superb training aid – its training feature helps you improve your backswing/downswing combination. It does this by taking pro golfer data as the basis for comparison to measure the perfect combination of the backswing and downswing. The Approach measures the speed to suit your skill level. You can set the combination of your choice and the watch will beep to tell you to start the swing and will beep again to show when you should move to the downswing. Needless to say, this makes it possible to practice your swing anywhere as long as you make sure you have enough room. Another function the Approach boasts is measuring the strength of your swing. This is done on the basis of the 100% swing fed to the device. This way you will learn to make the difference between 100% and an 80% or 70% swing. This is really important in terms of controlled shots or full-swing shots between two clubs. Users share happily that they could play golf without recharging the watch two days in a row. The watch has two disadvantages to speak of – its large round face isn’t very elegant as far as design goes, which shouldn’t be a surprise if you have experience with its predecessors, the Garmin Forerunner fitness watches. But maybe your non-golf playing partner or children won’t be happy about the fact that you’ll be sharing your golfing performance with them at the dinner table or anywhere else because you don’t actually have to be on the course to preview the holes. The Garmin Approach S6 offers a lot of features and functionality for its relatively high price. The training assistance, long battery life and full-colour touch screen make it really stand out from the crowd. 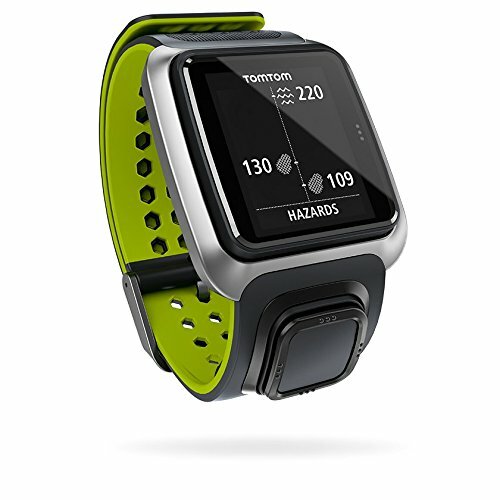 The TomTom Golfer’s advantage over the Garmin is pretty much it’s lower cost.